NSX supports three different types of Routing Protocols: Open Shortest Path First (OSPF), Border, Border Gateway Patrol (BGP), and Intermediate System to Intermediate System (IS-IS). While all three are supported, the Distributed Logical Router (DLR) can only use OSPF and BGP, while the Edge Services Gateway (ESG) can use all three. Let’s start with OSPF. OSPF is an interior gateway protocol that collects link state information from all available routes and creates a map of the network topology. OSPF makes routing decisions based on the destination IP address in the packet and uses a dynamic process of traffic load balancing between routes of equal cost. OSPF networks are divided into areas. A router can be a part of multiple areas, as long as one of the areas is 0, or the backbone area. 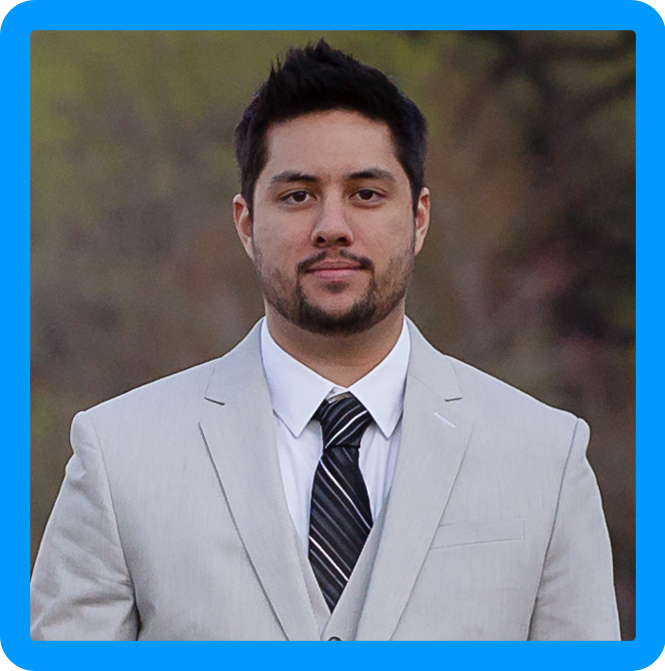 An area is defined as a logical collection of OSPF networks/routers/links that are all defined by the same area ID. 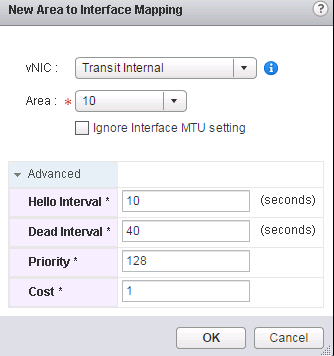 When configuring OSPF, you will also need to define both a Forwarding Address and a Protocol Address. A forwarding address is used by the router to.. well.. forward packets. A protocol address is a unique IP (same subnet as the forwarding address) and is used by OSPF to for adjacency with peers. 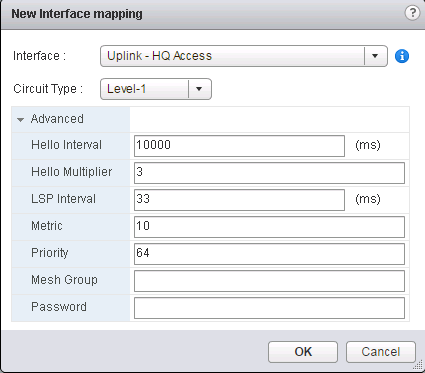 Let’s configure OSPF! Step 1. Log into the vSphere Web Client and navigate to Networking & Security -> NSX Edges and double click the Edge that for which you would like to configure OSPF. Step 5. Click the + sign under Area Definitions to add a new Area. 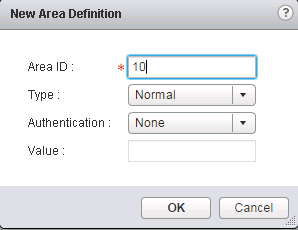 Specify the AREA ID and hit OK. (Optionally, you can configure the Authentication and Type). Step 8. Log into your ESG via SSH, and run the following command to confirm the devices are neighbors. The E2 by 172.16.20.0/24 means it was learned from OSPF. BGP is a used for a different purpose than OSPF. As mentioned OSPF is more of an interior gateway protocol, BGP however, is an perimeter gateway protocol; It is used as the edge of your network. BGP constructs a routing table of networks reachable among Autonomous Systems (AS) number defined by the user. Each router will have a Local AS defined, as well as a remote AS defined for it’s neighbor. A connection between both gateways is established first, and then routing information is exchanged between the two devices. Step 1. Log into the vSphere Web Client and navigate to Networking & Security -> NSX Edges and double click the Edge that for which you would like to configure BGP. Note: Again, if you are configuring multiple Edge devices for BGP, you will need to follow the same steps above for the remote BGP device. 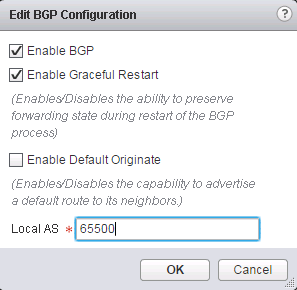 You can run the same commands above, substituting OSPF for BGP to confirm the neighbor relationship and routes. Routes learned from BGP will show a B next to them. 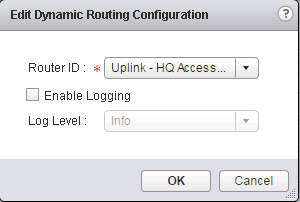 The last routing protocol that you can use in NSX, is IS-IS. This protocol can only be used on ESGs not on DLRs. 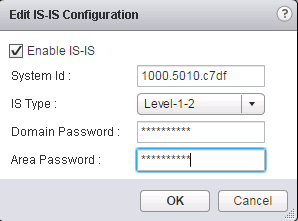 IS-IS is used to move data through the best route in a Packet-switched network. Much like OSPF, IS-IS associates routers into areas. There are two levels of areas Level 1 and Level 2. A Level 1 area advertises intra-area route information while a Level 2 area advertises inter-area route information. If you were comparing OSPF to IS-IS you could say that the Level 1 area is a non backbone area while the Level 2 area is a backbone area. Step 1. Log into the vSphere Web Client and navigate to Networking & Security -> NSX Edges and double click the Edge that for which you would like to configure IS-IS. 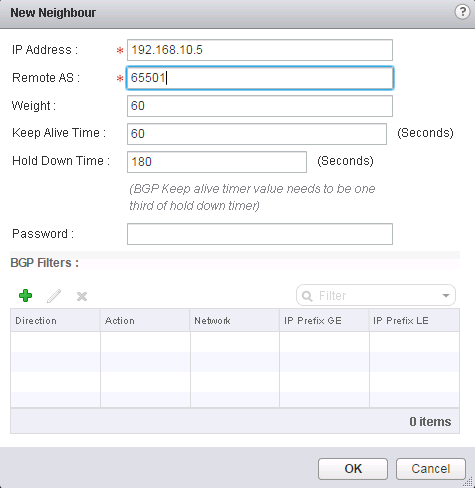 The commands to view the configuration and neighbors is slightly different.